The Yosi Samra fold-up flats have been catching my eye ever since a huge shipment of them arrived at Fine Finds. Last weekend, I finally bought a pair in silver. They truly are the Holy Grail of ballet flats. The elasticized trim ensures they'll stay on your feet, while the unadorned flats boggle the mind with their potential for customization. Pin some vintage brooches or shoe clips on the toes, or thread grosgrain ribbon through the loop in the back and wind it around your ankles for a ballerina-inspired look. Of course, these flats also look great on their own, especially if you buy them in one of the bright blue, purple, or red suede fabrications. I also love the portability of them, how they fold up in half and they come with their own silvery satin pouch. Imagine how great they would be for travel, or for those long evenings or special occasions where you're dying to get out of your sky-high heels by the time you leave. Oh, and did I mention that they're very sturdy and well-constructed as far as ballet flats go? At $69 Cdn (or $55 US if you purchase them through the website), Yosi Samra flats are a sound investment. They look darling. Are they squishy-soft, too? Or more like walking barefoot? They're really reasonably priced and so darn cute. Perfect for travel! Those are some pretty darling flats! Definitely perfect for keeping them around in your purse if your heels begin to betray you. Sal, they feel more like you're walking barefoot than squishy soft. Perfect for travel. I love metallics. As they only come in whole sizes, would you recommend sizing up or down for those who are in between? Angela, I'd recommend sizing up. I have small feet I'm almost a perfect size 6 and sometimes shoes are a little loose in the heel for me or a little bit too big. But the length is just right and the elastic makes them feel really secure. If you size down it might be a bit too small. These look great and sound so comfy... I may have to order me a pair soon! Those flats are lovely. LOL. And yes, they are portable and that's important. I used to stuff flats into my clutch when I went clubbing, so I can be comfy when I stumbled .... errrrrr .... walked home. so pretty! theses actually do look like ballet shoes! i live in ballet flats at work; unfortunately they end up being so beat up after a few weeks I need a leather pair that won't show any wear! omg those are sooo beautiful. and so dainty too. what lovely colour. love your idea of putting grosgrain ribbon through them - i would have never thought of that. i had a pair of folded ballet flats that i just loved to wear on the plane. I would bring socks to keep my feet warm but the flats would just fold away in a small baggie that go into my purse. I went to a store called Maud Frizon in Hong kong - it's apparently based out of paris. i thought i went to ballet flat heaven - the whole store was ballet flats in every conceivable colour and material. Very nice buy Lisa! They do look quite squishy and walkable. Can't wait to see some lookbooks featuring them! very pretty and versatile looking! cute! I love comfy, soft ballet flats that fold-up. 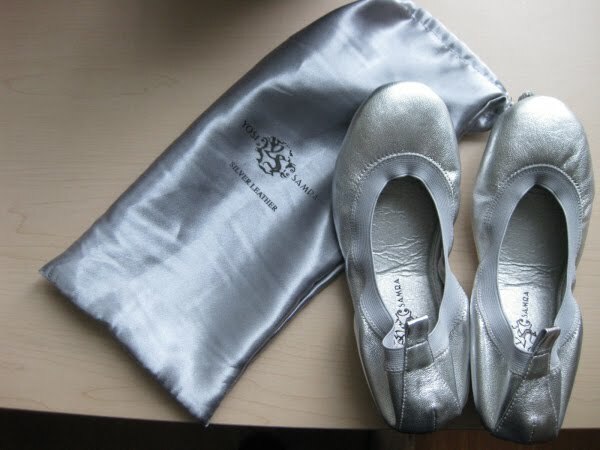 I've been wanting a pair of Sue London ballet flats for as long as I can remember. What other colours did these ones come in? These flats are beautiful! I wonder if I can get them somewhere in Toronto. I always wonder if I should have a fold-up pair of shoes in my purse in case I have to run away from falling buildings again. Now I have to consider running away from car bombs too. They are on sale now at an online sample site! If you email me for an invitation, I get a $25 referral credit if you buy! Thanks!